BAWS 2013 - Reports etc. BAWS U 2013 - Reports etc. North Bay defeated Alameda 10-2 in Game #1 of BAWS 2014. Peninsula 10, South Bay 4 in Game #2. Central 7, Contra Costa 5 in Game #3. In Game #4 North Bay 7, Central 6, advancing North Bay to the championship game. Contra Costa took down Peninsula 10-3 advancing them to Championship vs North Bay. Peninsula in 12:30 game vs Alameda. 10 AM game will be Central vs South Bay. South Bay won game #6 5-0 over Alameda. Central wins game #7, 4-3 over South Bay. South Bay and Leland HS catcher Brendt Citta named Spalding Most Outstanding all-around Catcher. Congrats Brendt! Alameda defeats Peninsula 6-3 in Game #8. 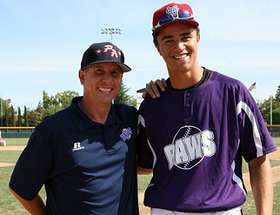 San Mateo HS catcher Ryan Fujinaga (2015) named Bay Area Fellowship of Christian Athletes Most Inspirational Player. Contra Costa wins BAWS 2014! They defeated North Bay 9-3. Vintage HS RHP Aaron Shortridge named Spalding Most Outstanding Pitcher and Maria Carrillo HS CF Clayton Andrews named Spalding Most Exciting Player. Live Streaming Broadcasts of all Saturday and Sunday BAWS 2014 games! Alameda defeats Contra Costa 9-2 to win BAWS Underclass 2014! 2016 OF/RHP Andre Nnebe named Spalding Most Outstanding Player. Most Outstanding Defensive infielder went to Vintage HS SS Juan Carlos Lopez-Rios (2016), Most Outstanding Defensive Catcher was San Marin HS catcher Dawsen Bacho (2016), and Most Outstanding Defensive 1st Baseman went to Maria Carrillo HS 1B Joe Bynum (2016). BAWS has partnered with GetEligible.com in order to help high school student athletes meet the NCAA’s mandatory academic requirements to play college sports. GetEligible.com is a high school transcript evaluation service which breaks down a student athlete’s courses, grades, tests scores and creates a customized report needed to determine eligibility. The report can be used as an academic road map for students and parents as well as shared with counselors and college recruiters. Take charge of your future and allow us to help you Get Eligible! BAWS participants are eligible for a $25 discount by clicking the GetEligible.com logo or using Promo Code BAWS25. Feel free to email me with questions. On May 6th RHP Evan Marshall of the Diamondbacks became the 10th former BAWS participant to play in the big leagues. He threw 1.1 innings and got the W against the Brewers. Marshall is a grad of Homestead HS and attended Kansas State. He was at BAWS in 2006 and 2007 and was drafted in the 4th round in 2011. Clearly he's gotten to the big leagues pretty quickly and is already a key member of the D'Backs late innings relief corps. He has that one W and also has two holds already. Congrats Evan! I've updated my list of college commitments (2014 grads). Take a look, see if I am missing anyone, including players who are recruited walk-ons. Send me an email if you see someone missing or if you know of kids who have committed but may not be on my list. To date there are 39 former BAWS players in the 2014 grad class who have signed or committed. To date there are TEN former BAWS players to have reached the Big Leagues, including six who made their debuts during the 2013 season and two so far this season (Mario Hollands and Evan Marshall). More to come! A total of 28 former participants were taken in the 2013 MLB Draft, including first overall pick RHP Mark Appel of Stanford. Catcher Andrew Knapp of Cal (2nd), RHP Alex Balog of USF (2s), RHP Carlos Salazar of Kerman HS (3), RHP Nick Vander Tuig of UCLA (6), C Grant Nelson of Saint Louis U (9), LHP Tyler Linehan of Fresno State (9) were all drafted in the first 10 rounds. Knapp went to Granite Bay HS, Balog to Mitty HS, Appel to Monte Vista, Vander Tuig to Oakdale HS, Linehan to Sheldon HS, and Nelson went to Serra. ANNOUNCING SPORT STARS MAGAZINE AS THE OFFICIAL MEDIA SPONSOR OF BAY AREA WORLD SERIES. BAWS IS EXTREMELY PROUD AND HONORED TO BE ASSOCIATED WITH THE LARGEST YOUTH SPORTS MAGAZINE IN NORTHERN CALIFORNIA. Coach Clemmens, I just wanted to let you know that I have verbally committed to Brown University. Blaine, thanks for providing a fantastic venue for players to be seen by college coaches. As you know Trent has participated in BAWS 2010, BAWS 2010 Futures and most recently BAWS 2011. Trent had pitched in a game a few days before BAWS and his arm was not 100% and you were very accommodating to let him pitch when he felt he was ready. Luckily for Trent, Brown University was still there to watch Trent pitch. There really is no other event in the area that provides the venue and the thorough feedback as your BAWS event. I could not have agreed more with your assessment and writeup for Trent... I particularly enjoyed your opening... "Put three inches and 20 lbs on Yee, with his present day stuff and pitchability and I think most, if not all college programs would be recruiting him..."
We could not be more happy with how this has all turned out for Trent. Thanks for everything as well as including Trent in your latest article on 9County9.com, "Best uncommitted 2012 grads" (this is what reminded me to make sure to email you). Best of luck to you and BAWS in the future. Hi Blaine, Just want to let you know that I have committed to Arizona State. In 2010 I participated in BAWS and that was the first ever showcase I participated in. I didn't perform necessarily well in that event, but it really opened me up to the whole year after and how to compete in future events. I did get a lot of recognition from BAWS. Many thanks to the exposure your event provided my son and the kind words from you in his profile from the 2010 BAWS. After thinking about other opportunities that were presented last summer, Austin recently made a decision to accept an offer to be a Washington Husky. Thanks again for inviting Austin to participate in an event that kicked off his summer, leading to accepting an offer to play baseball at the University of Washington. It was certainly a summer to cherish. 1. BAWS was better than ever. I think the kids, parents and coaches all get something special to kick off the summer showcase season. Katie never really got a chance to be around it with Brett (as we had to split time up with four kids) and just couldn't say enough great things about the entire event. And in talking to other parents, everyone seems happy about the value and experience. 2. I don't know if you have heard on any 2012 commitments (its early) but Braden Bishop committed to the Washington Huskies!!! And Drew committed to my rival (as you know, I am a Cal grad) the STANFORD CARDINAL. BAWS is a game changer! For those who are not aware, BAWS was originally created and run by me (Blaine Clemmens), starting in 2004 and through 2007. When I became a scout for the Atlanta Braves in November 2007 I was told by my former boss to not be out front of a showcase event. In order for me keep my event alive I determined that I needed a business partner to run it with me while I was scouting. With that partnership the name of the event changed for a couple years (to RNWS). Though I was not on the field running the event, I was directing/managing it from the press-box and also set up the on-field operations exactly as I did for BAWS. I am no longer scouting and am once again running our premier local showcase-tournament, the original Bay Area World Series (well, not the MLB version, but you get the point). In January 2010 I began operations of Blaine Clemmens (BC) Baseball. My business is always evolving but suffice to say that I am an independent baseball resource for college & professional baseball personnel, families & players. My background as a JC pitching coach, D1 pitching coach/recruiting coordinator (USF), MLB scout (Braves), Bay Area World Series founder/director, and Perfect Game national scout/evaluator has given me a unique platform/background to go forth with ideas I have wanted to put in motion for years. I even spent a short time as a travel ball coach back in 2000 with the Lafayette Generals. Of all the things I have had an opportunity to do and be a part of, I have taken greatest satisfaction serving as an accessible/credible baseball resource of information for players, families, scouts, coaches, and agents for so many years. I enjoyed scouting, but not nearly as much as I enjoy being involved with and positively impacting hundreds of young, hardworking ballplayers, their families, and those with interest in those players.